When even bike magazines can’t get the difference between peddle and pedal right, you know it’s time for another super-useful and majestically executed MS Paint usage cartoon. And if you are referring to the person doing the action, chances are you’re talking about a “peddler” (someone who is selling something) versus a “pedaler” (someone who is pedaling); the second usage is fairly rare. 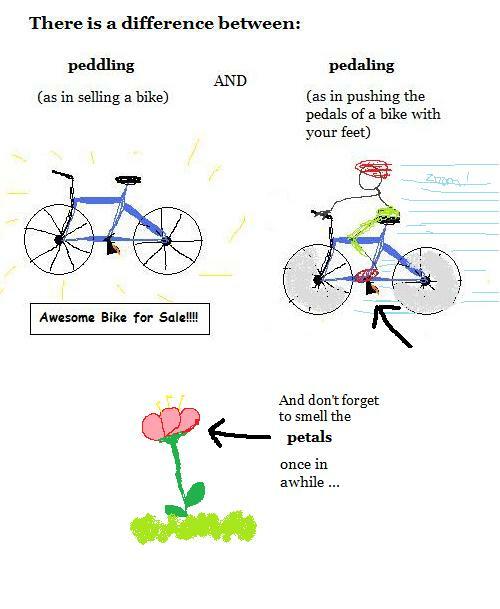 Are you peddling flowers or pedaling a bicycle? I can� t even remember the last time I picked up my toilet brush and put it to it� s intended use.